Rachman Bag Co. was originally located at 168 Harrison Ave. in the Bushwick section of Brooklyn. They were founded in 1947 and manufactured a variety of textile bags, including burlap and cotton. 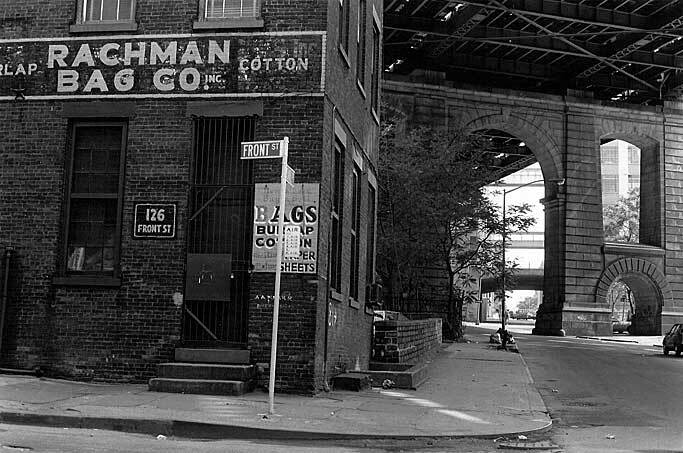 In 1957 Rachman moved to this building at 126 Front Street beneath the Manhattan Bridge in what is now called DUMBO (Down Under the Manhattan Bridge Overpass). They remained here until the mid-1990's when they relocated a block away at 205 Water St. Since that time they seem to have merged with the Ace and Brooklyn Bag & Burlap companies; the Rachman name is no longer used.